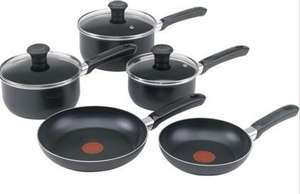 5 piece pan set, seems a good price since a 3 piece set is £30 in store and I couldn't find this set in store at all. Similar set (with a milk pan in place of a second frying pan) is £40 in Argos. Good price, thanks for posting . Out of stock! Have expired deal. Good, if you are at Asda's pass by the teflon and buy stainless steel cookware instead.